What are Tylenol and Codeine? 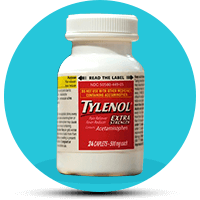 Tylenol is a well-known pain and fever reducer that had its introduction in 1955 by McNeil. Its main ingredient is acetaminophen which they use to treat many conditions such as headaches, muscle aches, arthritis, backache, toothaches, colds, and fevers. Codeine is an opiate-based drug and is most commonly used to treat pain and diarrhea. It is also one of the major ingredients of several prescription and non-prescription cough syrups. Tylenol with Codeine is a combination drug created to treat conditions that needs something stronger. What is a Tylenol-Codeine combination? Tylenol and Codeine are both potent pain relievers. The combination of the two is most frequently used after surgeries. It is a strong narcotic and analgesic/antipyretic. It applies its effects in the brain and nervous system to decrease severe pain. One should be wary of the dire consequences this combination can have on one’s system. This is because both Tylenol and Codeine are strong pain relievers containing acetaminophen. Excessive doses of acetaminophen (4,000 mg per day and more) can cause serious liver damage. Therefore, in the long run may even require a liver transplant. Furthermore, one should not use the combination of Tylenol and Codeine to treat any type of pain in under-aged children. When SHOULDN’T one take Tylenol with Codeine? If you are you are allergic to any of the ingredients found in Tylenol with Codeine. If you have very slow or difficult breathing, or if you are having an asthma attack. If you are consuming quinidine or sodium oxybate (GHB). What are the side effects of Codeine and Tylenol? What should one consider before using Tylenol with Codeine? If you are planning to become pregnant, or are already pregnant and breastfeeding. If you are taking any dietary supplements, prescription or nonprescription medicine. If you have any allergies to medicines or certain foods. If you are allergic to hydrocodone, morphine, oxycodone or other narcotic medicines. If you are suffering from a heart condition, a kidney problem, a liver problem, or prostate problems, and etc. If you have a chronic obstructive pulmonary disease (COPD) or asthma. What is the most important information one should know about Tylenol with Codeine? Have you recently used tranquilizers, alcohol, sedatives, or other narcotic medications? Then, you are highly advised against using Tylenol with Codeine. In addition, stay away from this drug combination if you have ingested MAO inhibitors in the past 14 days. They include isocarboxazid, linezolid, and methylene blue injection, etc.). Furthermore, exceeding the prescribed dosage can have irreversible dire consequences. As a result, to avoid liver damage and other ramifications, do not overdose on Tylenol with Codeine. Lastly, do you notice skin redness or a rash that spreads and causes blistering and peeling? Then, immediately stop taking this medicine and call your doctor. What are certain medications checked in combination with Tylenol and Codeine?